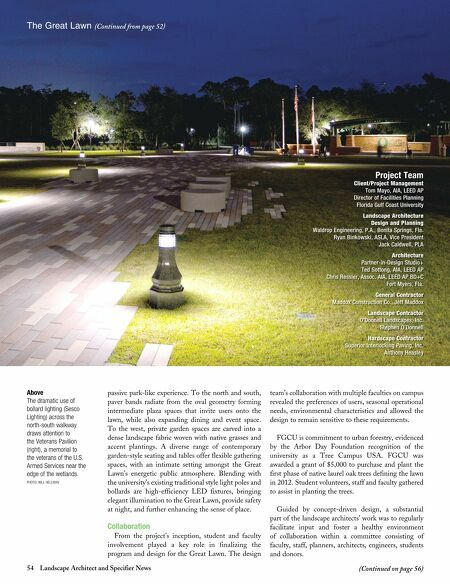 54 Landscape Architect and Specifier News (Continued on page 56) The Great Lawn (Continued from page 52) Above The dramatic use of bollard lighting (Sesco Lighting) across the north-south walkway draws attention to the Veterans Pavilion (right), a memorial to the veterans of the U.S. Armed Services near the edge of the wetlands. PHOTO: WILL HELLMAN Project Team Client/Project Management Tom Mayo, AIA, LEED AP Director of Facilities Planning Florida Gulf Coast University Landscape Architecture Design and Planning Waldrop Engineering, P.A., Bonita Springs, Fla. Ryan Binkowski, ASLA, Vice President Jack Caldwell, PLA Architecture Partner-in-Design Studio+ Ted Sottong, AIA, LEED AP Chris Ressler, Assoc. AIA, LEED AP BD+C Fort Myers, Fla. General Contractor Maddox Construction Co., Jeff Maddox Landscape Contractor O'Donnell Landscapes, Inc. Stephen O'Donnell Hardscape Contractor Superior Interlocking Paving, Inc. Anthony Heasley passive park-like experience. To the north and south, paver bands radiate from the oval geometry forming intermediate plaza spaces that invite users onto the lawn, while also expanding dining and event space. To the west, private garden spaces are carved into a dense landscape fabric woven with native grasses and accent plantings. 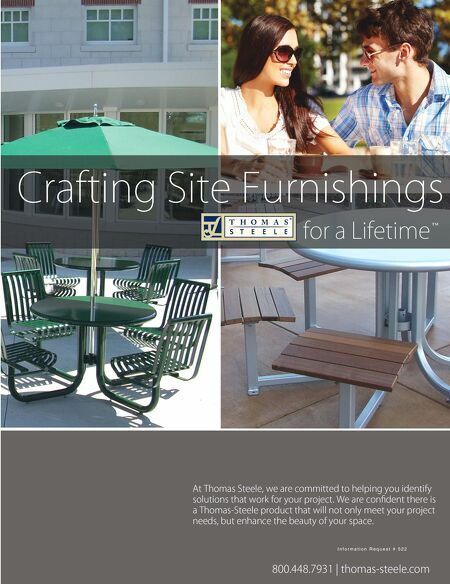 A diverse range of contemporary garden-style seating and tables offer flexible gathering spaces, with an intimate setting amongst the Great Lawn's energetic public atmosphere. Blending with the university's existing traditional style light poles and bollards are high-efficiency LED fixtures, bringing elegant illumination to the Great Lawn, provide safety at night, and further enhancing the sense of place. Collaboration From the project's inception, student and faculty involvement played a key role in finalizing the program and design for the Great Lawn. The design team's collaboration with multiple faculties on campus revealed the preferences of users, seasonal operational needs, environmental characteristics and allowed the design to remain sensitive to these requirements. FGCU is commitment to urban forestry, evidenced by the Arbor Day Foundation recognition of the university as a Tree Campus USA. FGCU was awarded a grant of $5,000 to purchase and plant the first phase of native laurel oak trees defining the lawn in 2012. Student volunteers, staff and faculty gathered to assist in planting the trees. Guided by concept-driven design, a substantial part of the landscape architects' work was to regularly facilitate input and foster a healthy environment of collaboration within a committee consisting of faculty, staff, planners, architects, engineers, students and donors.